Ilford Park Polish Home (IPPH) is the last remaining home run by Veterans UK under the Polish Resettlement Act 1947. Clare Thomas, Home Manager, tells us about this unique place, its history and about letting an internationally renowned photographer capture the spirit of ‘Little Poland’ for her latest body of work. IPPH has a fascinating and exceptional history, the home first opened in 1948 as Stover Camp, the site of a hospital built for expected D-Day casualties amongst American troops. IPPH was one of 45 camps whose purpose was to resettle members of the Polish forces into a new life in Great Britain. The Polish troops who fought alongside the allies were unable to return to a communist dominated Poland due to political changes and many feared imprisonment if they did return. The Polish Resettlement Act 1947, also affectionately known as the ‘Churchill Promise’ was in recognition of the immense war effort of the Poles who served so valiantly under British command. Over the years, all the other camps have closed; IPPH remained and has evolved from a resettlement camp into a residential care and nursing home for older Polish people and their spouses. To be eligible for admission under the Polish Resettlement Act, applicants need to demonstrate that they fought with the Polish forces under British command, were displaced from Poland due to circumstances attributable to WW2, or the spouse of either of these categories. 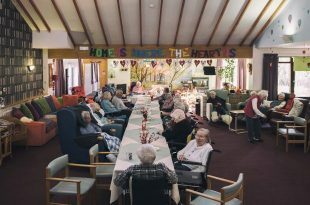 Today, IPPH is a residential and nursing home with some sheltered accommodation and the average age of the people living here is 91, with more than 50% of the population living with Dementia. As with any other care or nursing home, IPPH is inspected by the Care Quality Commission (CQC). We have an excellent reputation locally and we are very proud of the experiences we offer to this older, vulnerable group. In a recent survey, one person expressed that IPPH was a “first class home with highly motivated staff across all levels of delivery. Results in an overall culture of providing care to a high standard in an atmosphere of safety and serenity”. Another relative expressed that her Father seemed 10 years younger since coming to IPPH due to the care he received from us. The Polish culture and traditions are celebrated and a Polish priest lives on site and holds a daily mass. Christmas is a very special time with Christmas Eve (Wigelia in Polish) representing all that is traditional in Polish culture and religion. Without a doubt, it is at these times that IPPH feels like a huge, welcoming family. In January 2016, we were approached by a photographer, Karolina Jonderko who had secured a scholarship from the Polish Ministry of Culture and National Heritage to complete a photographic history project. Karolina felt very passionate that most of the information available about this displaced community had been written for British readership and that very little was known about this historical event in Poland. Karolina spent more than a month with us at IPPH, photographing the people who live here and listening to their incredible stories. Karolina said that no other place existed like IPPH and that she felt she had joined an extended family and that she appreciated the opportunity to raise awareness of ‘Little Poland’ in her homeland. I was very touched by the sensitive way that Karolina approached this project and how much she took her work, and the people who live at IPPH, to her heart. Looking to the future we hope to continually develop our services, especially in the area of Dementia. The Quality Care Commission will make a judgement about IPPH under the categories of Safe, Caring, Well led, Responsive and Effective and we aim to be outstanding in all of these areas. Clearly we have a declining Polish population that meet the criteria for the home so we have taken the opportunity of offering some of our spare capacity to members of the charity Blind Veterans UK who live in the South West. Although early days, this has been a positive experience which we hope will develop further. I have felt privileged to be the manager of IPPH. We have some amazing, committed staff that care deeply for the people they look after. I have seen how IPPH has developed over the years and how skilled the staff have become in making every moment matter.